If you run a bounce house rental company, it is essential to provide quality inflatables to your clients. Safety should be the #1 priority for your business, and high quality products will ensure a return on investment. So where do you go to make sure you are getting the best value for your money? There are a countless number of bounce house rental companies in Los Angeles, but not all of them provide the amazing service and quality jumpers that clients deserve. Many start up companies will turn to the cheapest bounce house manufacturers because they aren’t willing to invest in quality. We all know the dangers in cheap inflatables: they are not as dependable or reliable as quality inflatables that come with warranties and last for years on end. This is where UltimateJumpers.com comes in. Ultimate Jumpers has been in the jumper manufacturing business for almost 10 years. There is a reason why they are the best bounce house manufacturer in Los Angeles. They provide incredible customer service because of their knowledgeable, professional staff. In addition, Ultimate Jumpers utilizes the most high quality materials to manufacture inflatable units of all kinds. This includes jumpers, bounce houses, inflatable combo units, slides, and obstacle courses. The most important factor to consider when starting up a bounce house rental business is whether your purchase will give you a return on investment. Think about the most versatile, high quality inflatables; these are the ones you will be able to use time and time again without worrying about them falling apart. 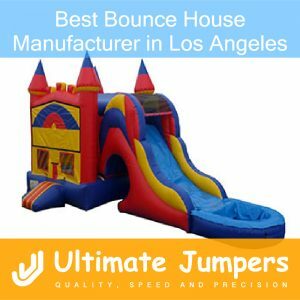 UltimateJumpers.com carries a wide variety of inflatables, including bright colored versatile ones that will go with any party theme. So what are you waiting for? Make a smart business investment by relying on the services and products by UltimateJumpers.com.